Every item in my home has a story behind it. 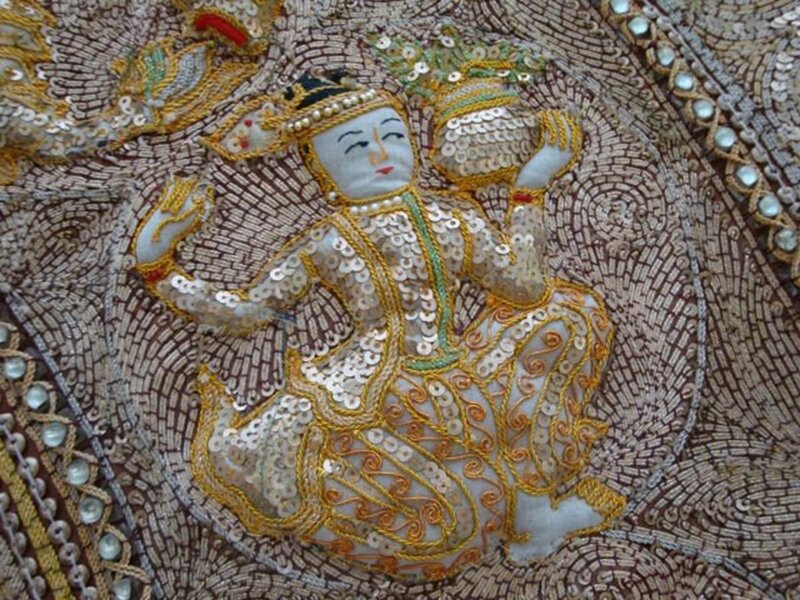 One of my most treasured items is a Burmese kalaga which is the traditional name for an embroidered tapestry from Myanmar (Burma). 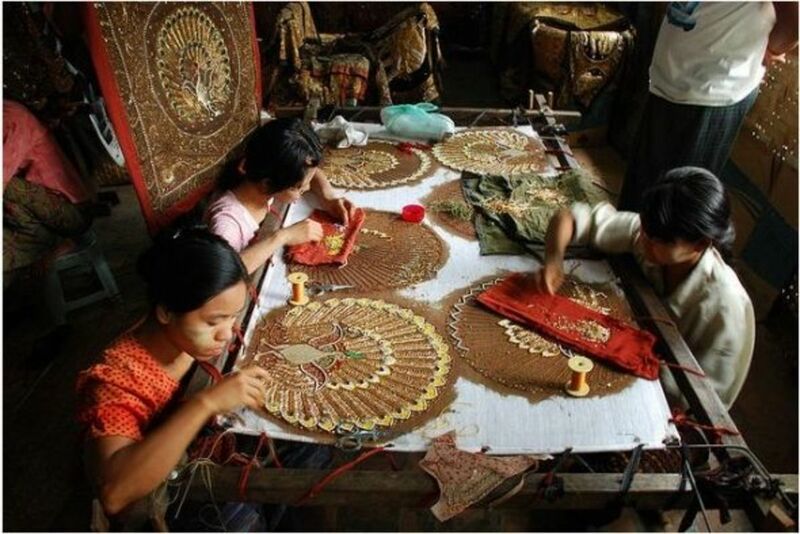 This style comes from the Mandalay region and the tradition goes back more than a century. 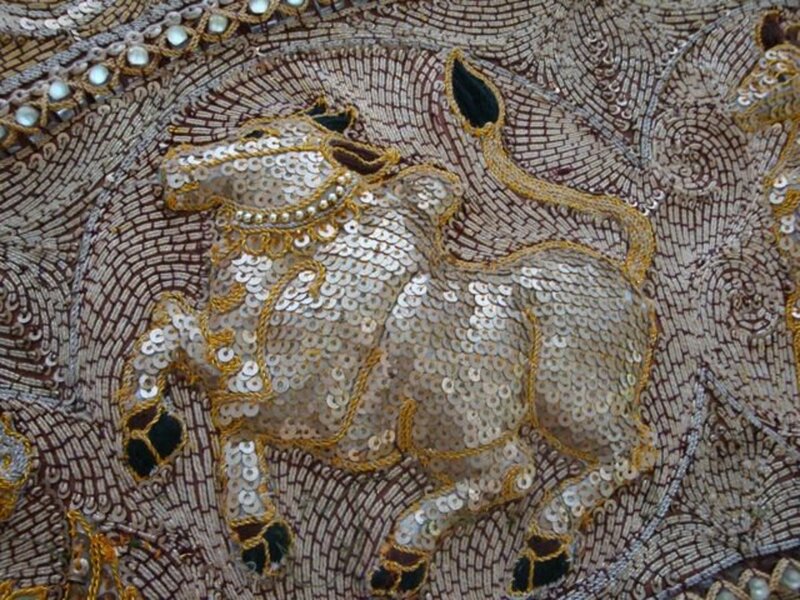 Kalagas are generally made from linen, silk, velvet and cotton embellished with sequins, embroidery, beads, pearls. 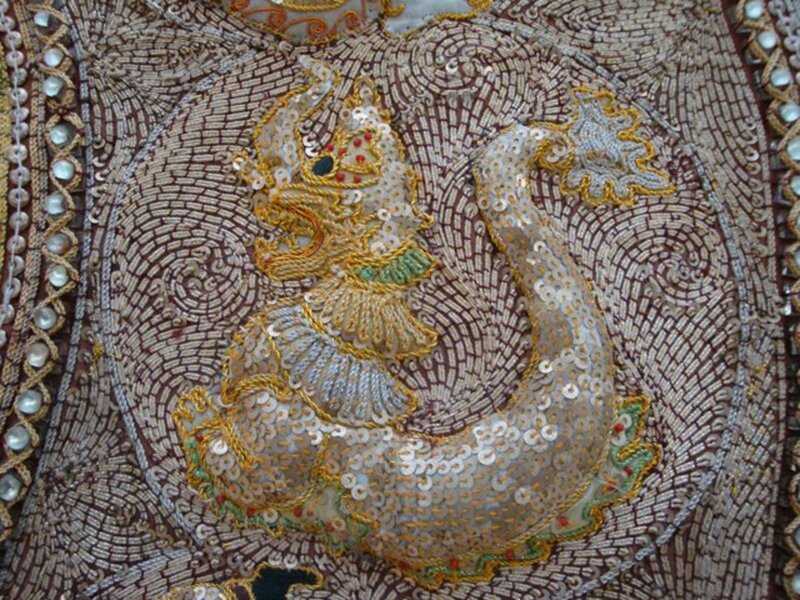 Depending on the intricacy of the design and size of the tapestry, this piece of art can take several weeks to make. A kalaga is truly a unique wall art that I proudly display in my home. 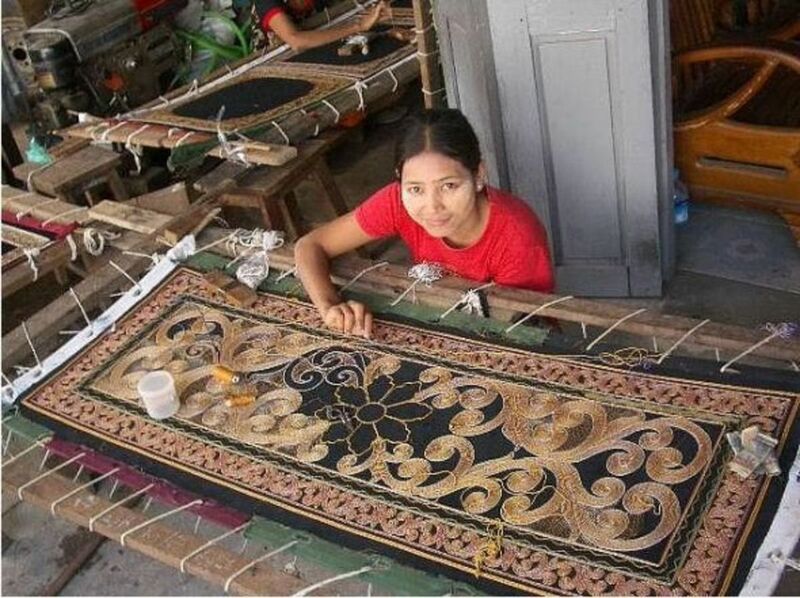 Kalaga is the traditional name for embroidered tapestries done entirely by hand from Myanmar (Burma). The ancient kalagas were made for the royal palaces. 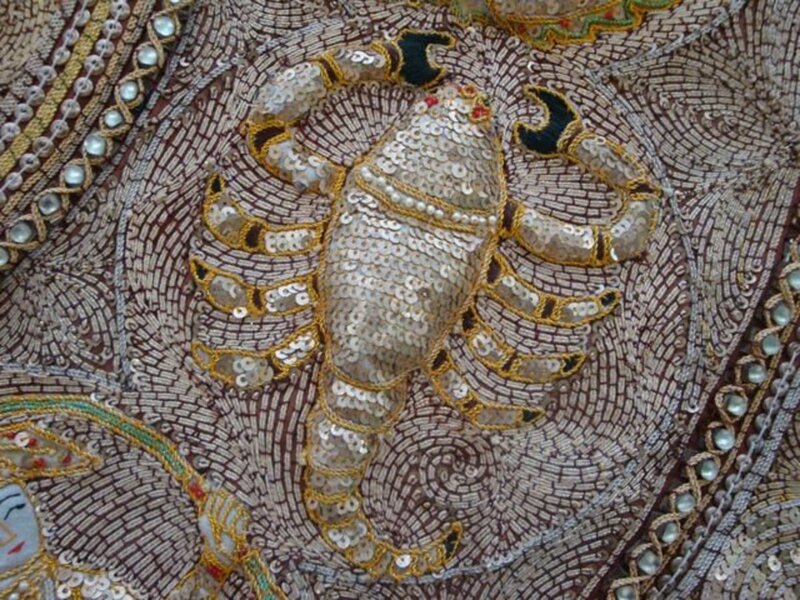 These are intricately embroidered using sequins, beads, colored stones, small pearls, coral, braids, metallic threads on linen, velvet, silk or cotton. 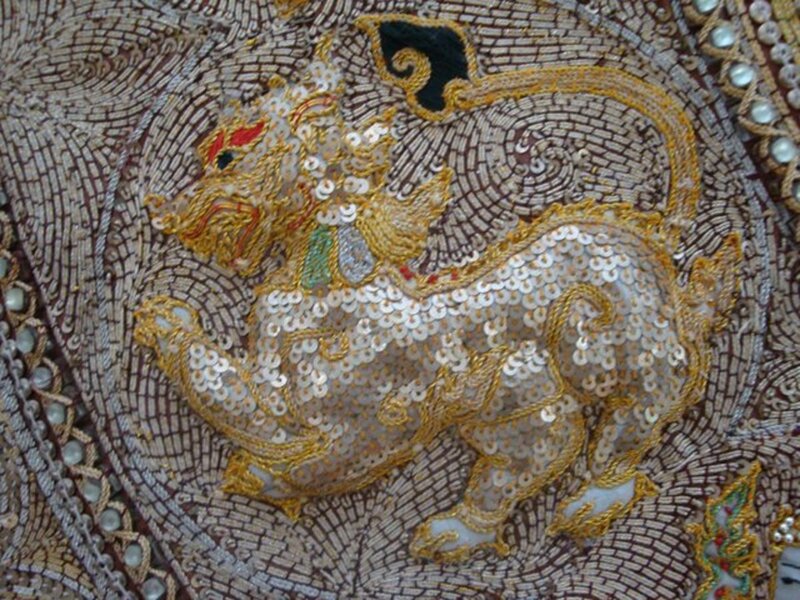 Gold and silver threads, called "shwe-chi-doe" in Burmese were attached to the backing of a cloth and decorated with beads. 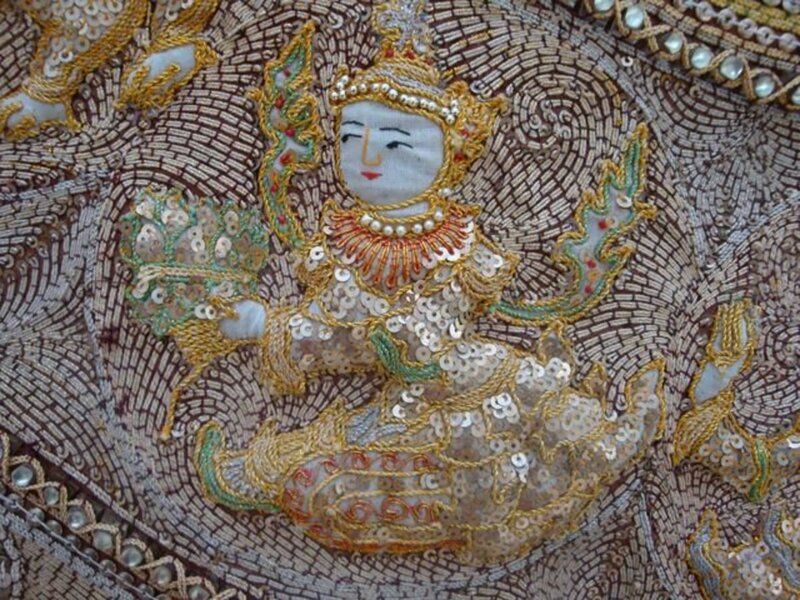 Items made using the "shwe-chi-doe" method were and still are rare because they were made from real gold and jewels, making them prohibitively expensive for the common person or every day use. Most Kalagas are best hung in a frame but not under glass so that the detail and texture can be fully appreciated. They can also be hung as-is without a frame.These are scenes from the ancient epic Hindu poem, the Ramayana, or from Buddhist mythology. Every bit of the finished piece is covered so you can imagine that a large piece could take months to complete! Kalagas were first developed in the Mandalay royal court and they reflected the designs found at that time in the palaces and in the pagodas. These quickly became popular not just as wall hangings but as curtains, room partitions and even coffin covers!! The designs used are inspired from very old stories which gives them an antique look. Kalagas commonly depict stories from the Jataka (Buddha's journey towards enlightenment) and the Ramayana (Hindu epic Journey of King Rama) as well as historical scenes, lucky animals and signs of the zodiac. 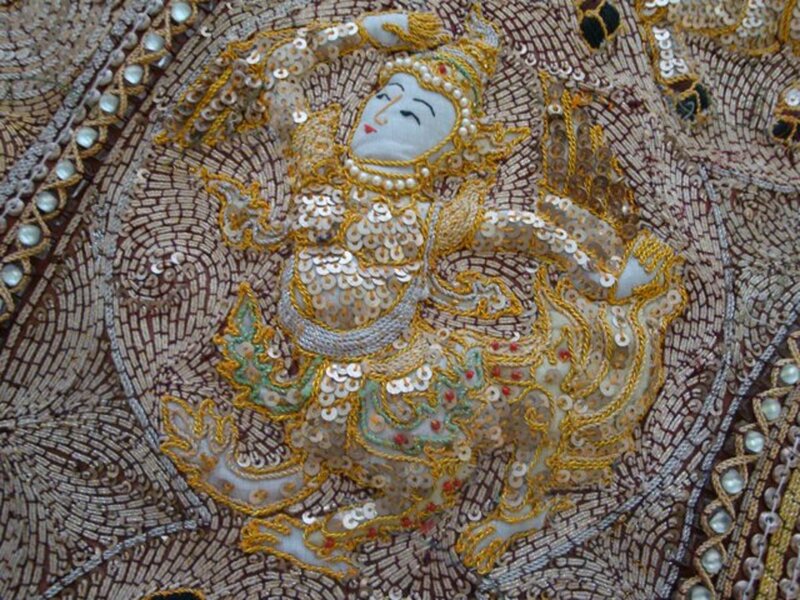 Like the decorations you might see in an ornate Burmese temple, Kalagas are awash in colorful and shiny details. Kalagas originated in Burma (Myanmar) many centuries ago. Cloth is stretched over a frame and then beautiful heavy metallic thread is sewn into place by hand. 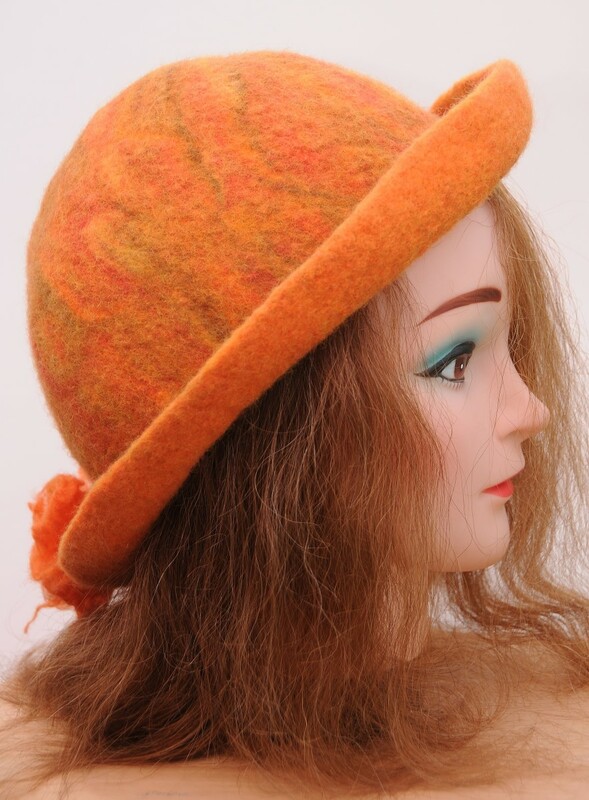 Sometimes padding and sequins are added to give a three dimensional effect. A kalaga begins by stretching a backing onto a frame and attaching it. The figures are decorated and then attached to the backing. The figures are raised by stuffing them with cotton or a similar material, giving them a quilted quality and a 3-dimensional effect. The last step in making the kalaga is to fill in the background. Kalagas are famous for having backgrounds crafted in beautiful swirled patterns of sequins. 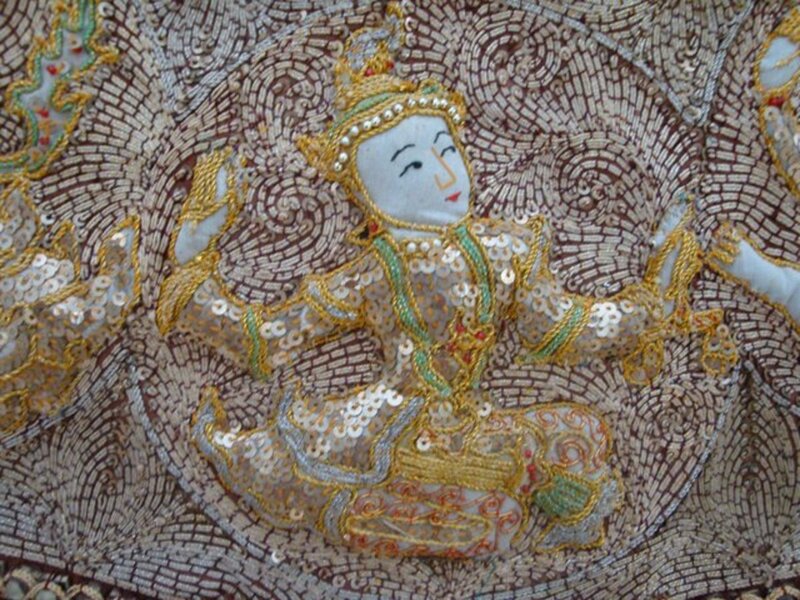 Handbeaded kalagas from Thailand - Affordable works of art for your home, office or give it as a present. No two kalagas are ever alike. Each one is as unique as the artisan who created it. The most popular stories illustrated on kalagas have some sort of religious significance. One popular theme is astrology; another is auspicious animals. Elephants, especially white elephants are common. You will also find the Burmese symbol for purity and good character, the hintha (often confused with a duck), depicted. Another popular animal is the peacock, which is a symbol of beauty and also represents the sun. 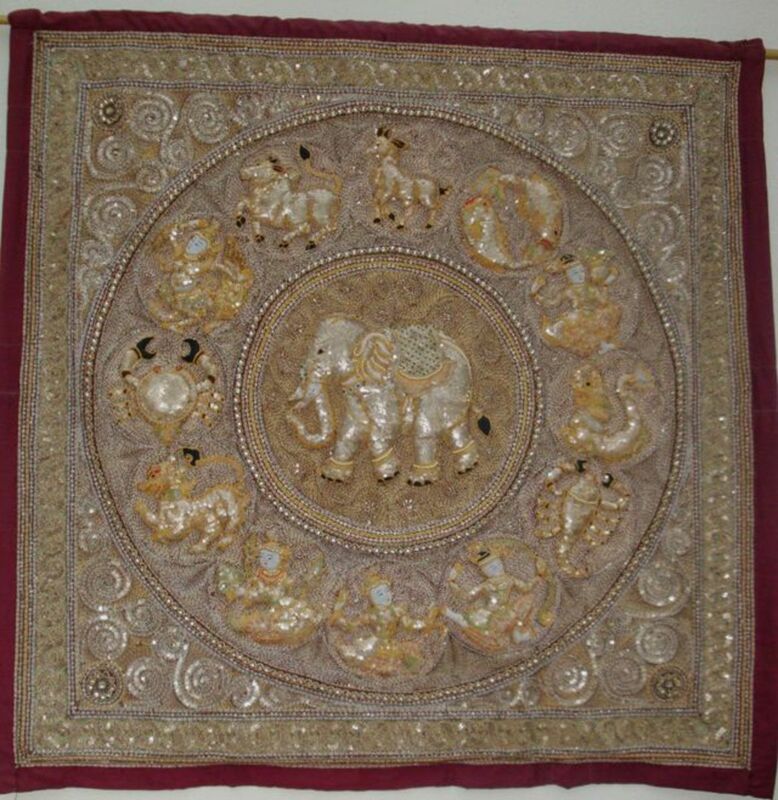 This is a large 4' x 4' kalaga hanging on the wall of my home. I sewed a pocket behind the tapestry so a rod can be inserted in it. This will make it easy to display the kalaga as a wall hanging. 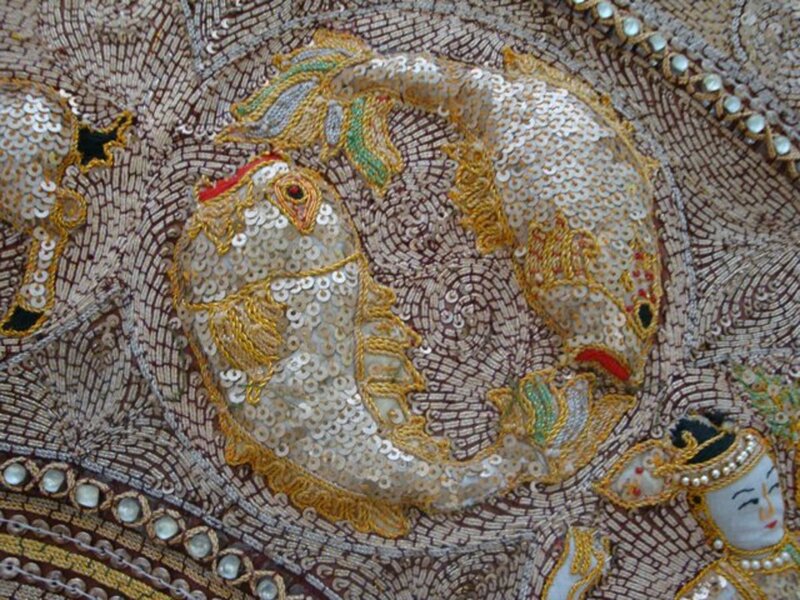 It is intricatedly embroidered with colored beads, pearls, sequins and silk and gold thread. The elephant, one of my favorite lucky symbols for the home, graces the center of the kalaga. 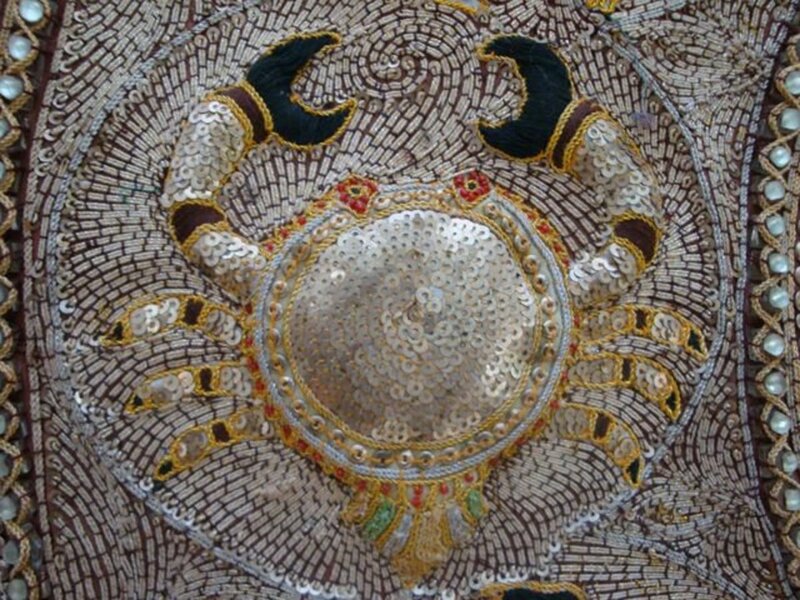 It is covered with sequins; its saddle and collar adorned with green beads and white pearls encircle its legs and the crown of its head. The most important feature of the elephant is that it has its trunk up! This is believed to be a lucky symbol. 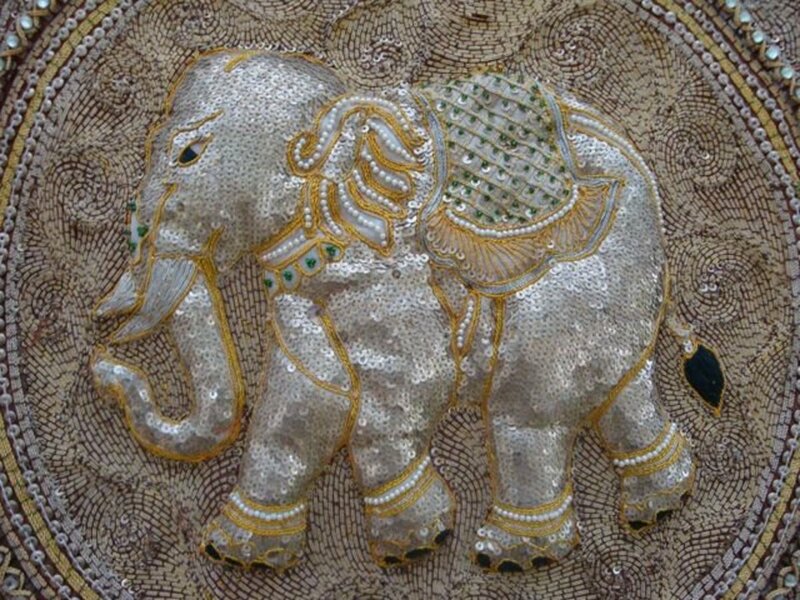 The symbols of the Burmese Zodiac are similar to those used in Western Astrology.This piece features one elephant surrounded by the 12 zodiac signs. 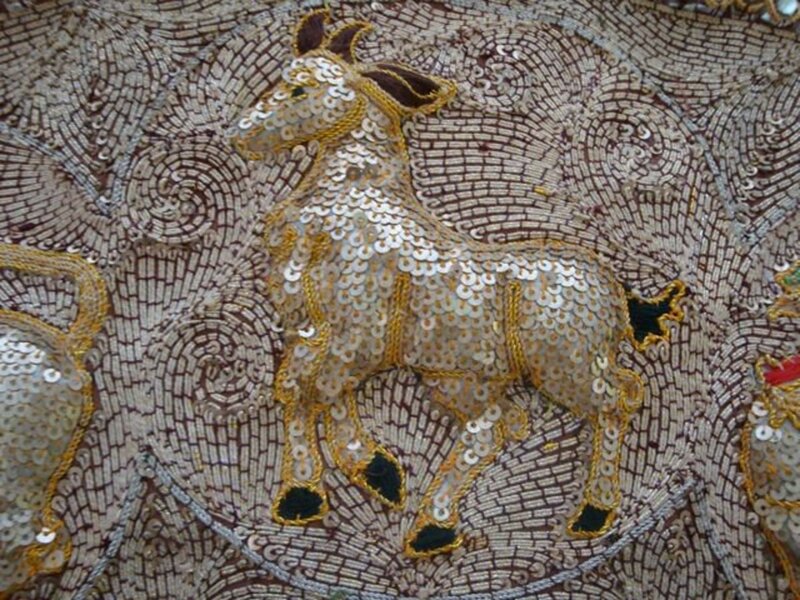 I attempted to match the embroidered figures on the kalaga with the corresponding Zodiac signs to the best of my ability.The goat (Capricorn) appeared to be missing and instead a dragon-like figure was in its place. This interpretation or misinterpretation of the Zodiac signs add character to the piece since no two kalagas are alike. Take this poll of discovery. Have you ever seen a kalaga before? I'm so glad I found you. I have a HUGE one of these and know nothing about it. I bought it at an antique shop in Boulder for about $1500 several years ago. 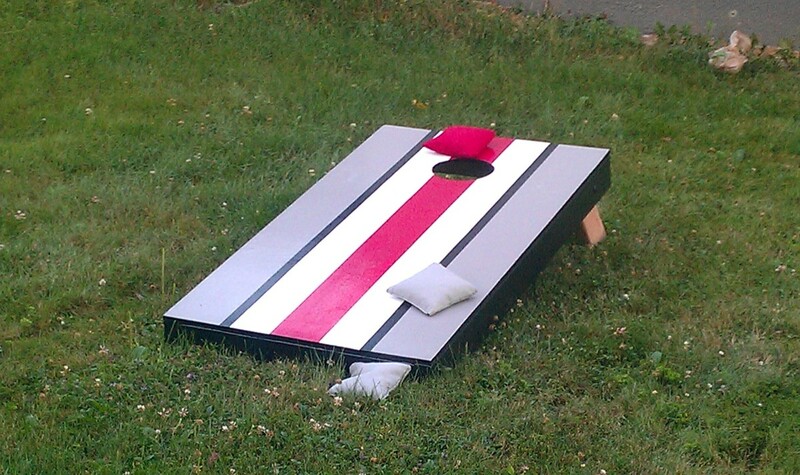 It is approx 6 feet x 11 feet. I would love to send you pictures to see what else you might know. 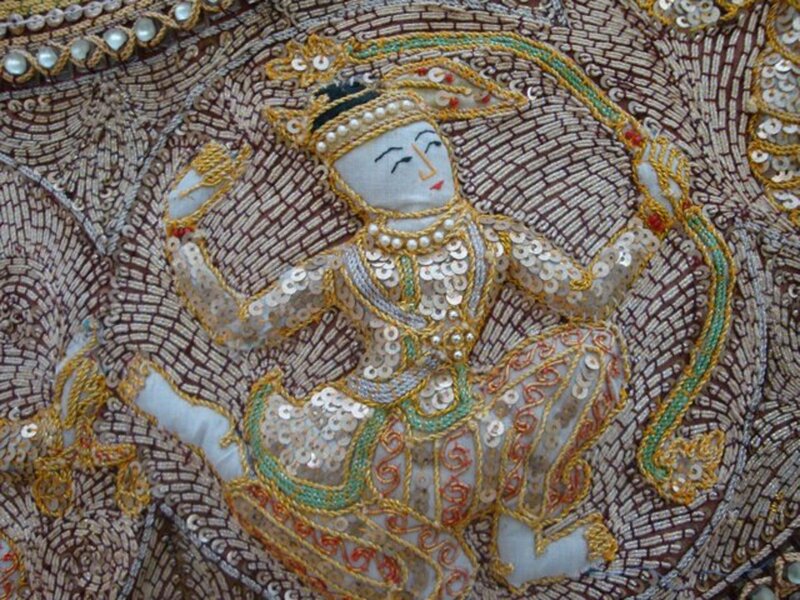 Tapestry exactly as you have described: gold and silver threads and pearls but no figures: just an intricate pattern. Have you seen anything like this? I was hoping that someone out there would be interested in checking out what I just realized is a kalaga. Its in a frame without glass , stuffed for 3d look, original frame, starting to think this might be pretty rare. 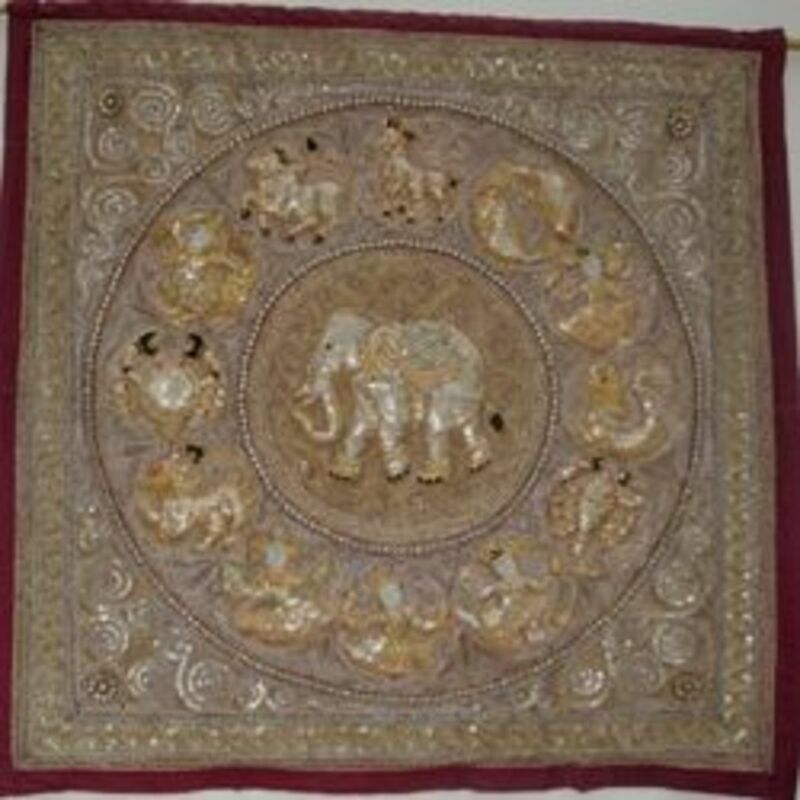 I have a large 140cm x 80cm three dimensional tapestry of two elephants looking inwards at a possible fountain or a pot with a tree growing out of it. The background is blue with an orange swirl outline on a black handmade backing. What could you tell me about this. I never learned the story. Just like it. I am happy to know more about this form of art. Wow - these are amazing! Thank you for sharing! Blessed by a SquidAngel! I own a very beautiful Kalaga, and have been trying to learn about it's origins for years. You seem very knowledgeable on the subject. There are three people in the Kalaga. The two on each end are riding horses and the one in the middle is riding some sort of giant cat. They look like they are going into battle or something. It is a very nice piece, but there are no pearls. Lots of metal sequins and glass beading. Lots and lots of metallic threading. I just thought you might be interested in knowing about it, as I have enjoyed the information and pictures in this site. If you have any cool information on something like that please let me know. The Kalagas are surely incredible works of art. I've never owned one, but sure appreciate all the work that has gone into these pieces. 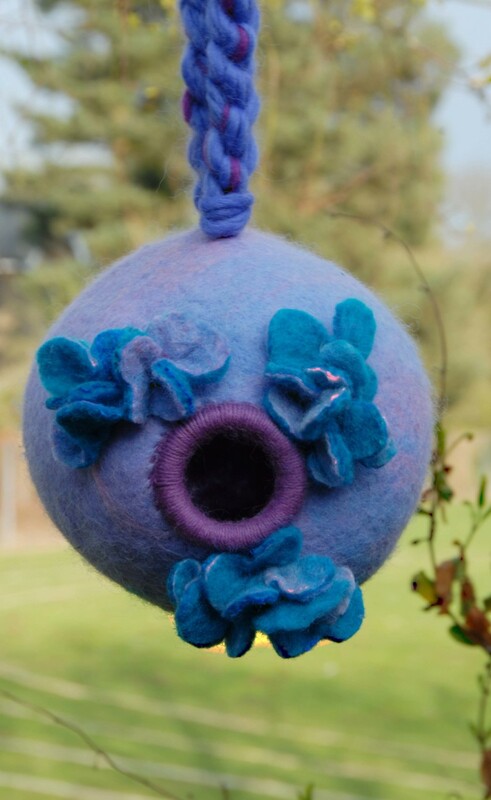 What patience and skill is required to make these! I currently have a beautiful tiger Kalaga and it is exquisitely made. Thank you for teaching more about it. Very beautiful lens. Thank you for sharing. These pictures are so detailed and the tapestries are really ornate. Great lens! Awesome lens, you have to be really skilled to make incredible things like that! 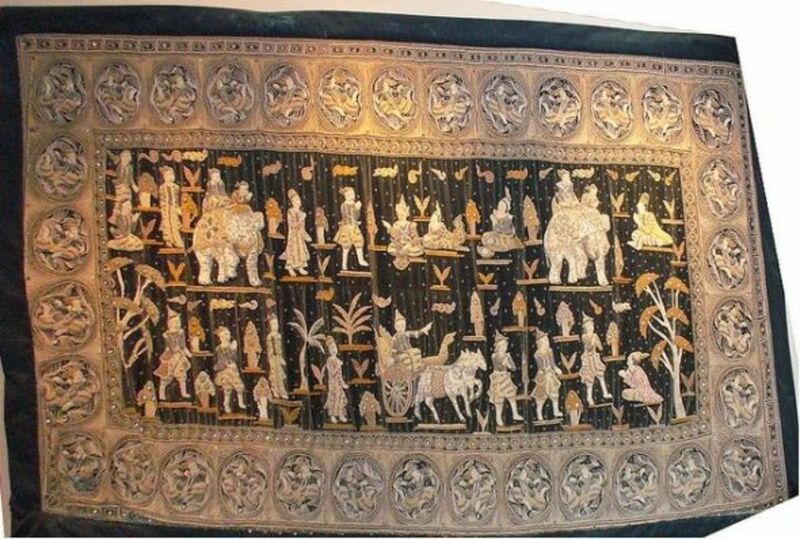 The Burmese tapestries are piece of art and look magnificent. A beautifully done lens. What a beautifully presented lens. Thanks for introducing me to this craft. I love your lenses. I am learning so much about other cultures that I didn't know about. Thank you.